In November of 2007 Google had invited users to beta test a new form of advertising which was available to Adwords advertisers. At that time they called it the product plus box. The product plus box enabled advertisers to include additional information into each of their ads including pricing, product description, images, and more for up to 3 different products. Here is an excerpt of what Google said about this technology. Since its inception in 2007, the concept has grown and now includes two different ad formats; the good news is it doesn’t take a lot to get started. The thing I find hard to believe is that many stores are not taking advantage of this unique opportunity—likely because they never knew it existed or because they don’t know how to make it work. I can’t see any other reason why one would not take part. Google says these new features help you to gain more clicks, gain higher quality clicks and gain higher ROI. Early tests show this seems to hold true. While researching the addition of this feature to a few ppc campaigns I found that the information on what it is and how it works is scatter across the internet—because of that, it can be confusing to decipher proper implementation. In this article I’ll sum it all up in one location and show you how to take advantage of the current ad format options provided to you through the various Google search channels; but before I do that, let me bring everything up-to-date. As of this writing, Google Base is now called Google Merchant Center. In addition, Google has developed its previous 2007 concept into what they call Product Ads. The Product ads have two ad formats: Product Extensions (formerly known as the Product Plus box) and a new feature called Product Listing Ads is also offered. “Product listing ads are a stand-alone shopping ad format that uses product information from the advertiser’s Google Merchant Center account. 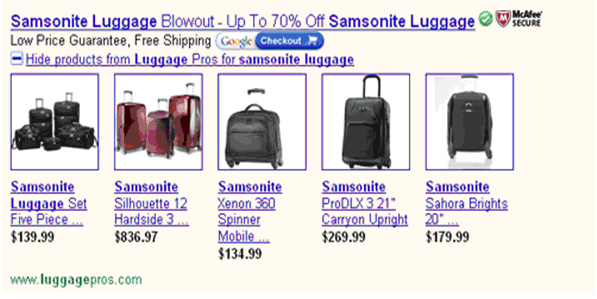 These ads appear in a variety of formats and feature relevant product information, such as the image, price, or name. They can also include an optional promotional message managed in your AdWords account. Product listing ads focus on targeting product information to users and are not designed to focus solely on merchants. For example, ads from competing advertisers may appear together in cases where multiple merchants are selling the same product. Product extensions are an ad format in which product information accompanies a standard text ad with standard keyword targeting. They also use product details from a merchant’s Google Merchant Center account and feature multiple products from only that merchant. Product information appears next to the text ad, which allows users to get a better sense of the advertiser’s product selection prior to clicking through to go to the advertiser’s site. In short, Google Product Extensions (the plus box) works just like it did in it early days. 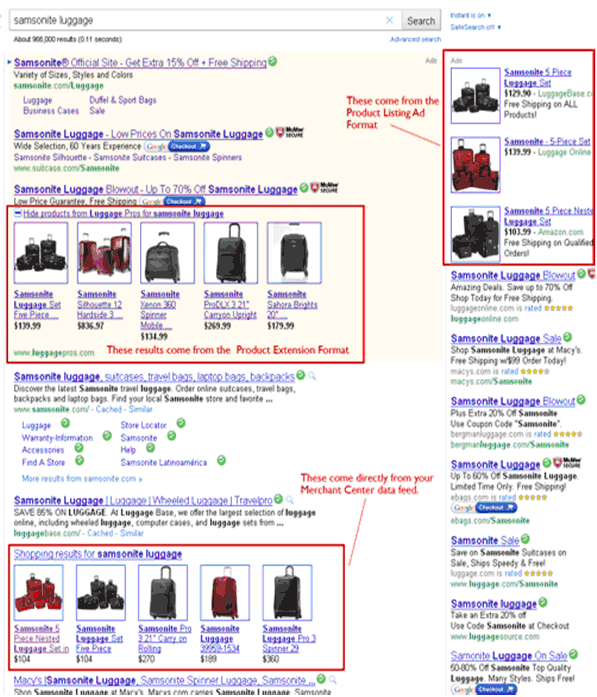 Searchers have the ability to see products images and title text under your AdWords ad (your sponsored listing). They achieve this by clicking on a + sign found next to the ad. You are not charged for this initial click (for them clicking the + sign.) If after clicking that plus sign the searcher decides to click on any of the information they find within the expanded results, you are then charged for the click as part of the typical Adwords CPC model. Google offers this additional information on Product Extensions (from the Google website). “Product extensions allow you to use your existing Google Merchant Center account to highlight your products directly in your Google.com search ads (and Google Images ads when opted into the Search Network). Product extensions will not appear on other Search Network sites, or on Display Network sites. Product Listing Ads are designed to take advantage of either a CPC (meaning you pay when a visitor clicks your ad) or CPA model (meaning you pay only when the click results in an actual sale on your site) however, at the moment, only a select few larger advertisers are offered the opportunity to give the CPA model a try. Product listing ads currently appear in the right hand search column and do not include the opportunity for expanded information via a + sign. What you see is what you get yet the setup can be controlled to some degree by what you feed Google. Google offers this additional information on Product Listing Ads (from the Google website). Now, In order to make this all work you’ll need several things in place. A Google Merchant Center account. Your Adwords account linked to your Merchant Center account. Your Merchant Account linked to your Adwords account. I won’t go into how to setup a Merchant Account in this article or the associated data feed, but I will give a brief overview of how to tie your Adwords and Merchant Center accounts together. Keep in mind that you can add multiple AdWords accounts to a single Google Merchant Center account by following this same process for each account you would like to link. When you do this, be sure to link accounts in both the Merchant Center and AdWords interfaces to complete the process—linking on one side only will not work. After linking your Merchant Center account to your AdWords account, your work is not complete. You must now link your Adwords account (from the Adwords side) to your Merchant Center account. The following instructions will show you how to do that. Select the Google Merchant Center account you’d like to associate with your campaign. (Your Merchant Center account must be linked to your Analytics account for this to appear). It can take up to 12 hours from the time you update your settings for your product extensions to appear in your ads. If you’re creating a new Merchant Center account, be aware that you may only register one domain with the account. If you would like additional domains registered with Merchant Center, you must create a new Merchant Center account for each separate domain. I’ve talked about the two ad formats offered by Google here but did you know that implementation of the outlined information within this article gives you the opportunity to gain potential exposure for your products in three different locations found within Google search? The key is the Merchant Center account. With that (and the proper linking demonstrated above) you get three chances for exposure. The image below shows exactly where each of the three spots might be and which Google ‘product’ feeds them. The opportunity present by taking advantage of this Google offering is just too good to pass up. If you haven’t taken the time to fully integrate your products into Google search, now is the time to do it. The opportunity is completely free and the results from those using it currently are good—but you can’t capitalize on it if you don’t try it. When is it Right to Drive Traffic to Your Website? Everything in business has its place, and each is equally important to its respective task. Traffic is no doubt very important and a must for building any business. However, a number of things have to be in place prior to that traffic actually helping sales, and even then, the traffic must be qualified. It’s an all too common misconception. Many people believe that to increase sales you must increase traffic. Seems logical, and should work, right? Not always. They focus so much on traffic that they forget (or choose not to) work on the other parts of the business. They are convinced that increasing traffic is the answer they have been looking for to increase sales. However, they often find that more traffic isn’t all it is cracked up to be. They end up frustrated with shattered hopes—the traffic levels increased but the sales they expected to achieve from that increase simply weren’t there. They scratch their heads and can’t understand why it didn’t work the way they thought. After all, they got more traffic, so they naturally should have increased sales right? Wrong. The real fact is traffic alone will never increase sales. It’s the combination of the right quality of traffic mixed with the right design and plan that does. Without the right design and plan in place, it doesn’t matter how much traffic you receive, your chances of sustained sales increases are slim. I’m sure you’ve heard the saying ‘you can’t put the cart before the horse.’ Hold that in the back of your mind for a minute and we’ll recall it later. PPC and SEO are just two methods for driving traffic to a site. For sake of this article we’ll leave it at that. These two marketing channels are going to be critical toward developing a successful and sustainable business—but each has it’s time and place for being utilized. First and foremost, you must ensure that your website is ready to convert any traffic you receive into customers for without this you’ll fail. You only get one chance to make a first impression, and if you aren’t ready you’ll find that you lose far more customers than you gain. Let’s say you are shopping for a certain show shovel (the traditional ‘brick and mortar’ way … not on the internet.) You have may options to choose from around you and you choose a local hardware store (aptly named Hard to Find Hardware) that you saw a lot of advertising for (via radio, TV, local papers, etc…) They no doubt are all over the place and getting the exposure they need to bring in the traffic—in fact they made it very easy to find them. But as you’ll soon discover, they forgot one critical element. In all their effort increase traffic to the store, they overlooked or forgot to make sure that once you get to the store, you quickly find the shovel you are looking for and then get out the door with it in a fast friendly manner, satisfied and happy that your entire experience with them was right—and because of that experience you’ll be back in the future to do business with them again. It’s called the customer experience and it plays a crucial role in winning sales, keeping customers, and sustaining a lasting business. After figuring out the door on your own you walk into the store and notice right away that you don’t see a single person in site. It’s dimly lit (no doubt because the owner is trying to save on energy costs to offset the high expense of driving traffic to the store.) Your first impression isn’t good—but there’s more to come. You try to ignore the current uncharacteristic circumstances, and decide to press forward in search of the snow shovel you saw in the ad. Much to your surprise (and frustration) you find that not a single aisle is marked with a sign indicating what it contains—and oh there are aisles! You begin to wander aimlessly up and down each unmarked aisle in search of the snow shovel you came for with no luck at all. The store owner then replies to you saying “Oh, you want that type of shovel. When I choose a shovel I look for it based on its function and since most shovels ‘dig holes’ they can be found in the section with things like power drills, nail guns etc… which also make holes.” Trouble is, you don’t search for shovels like that and the type of shovel you are looking for doesn’t dig holes … it pushes snow. At this point it’s safe to say any customer that stayed to this point now decides to leave. Many more won’t even attempt to buy from this store as they heard about the bad experience from those who tried it. Good news travels fast, but bad news travels faster. You are determined though. You didn’t come all the way out here, spend this amount of time in the store, waste gas, and think you’re leaving with nothing in your hand right? You want that shovel. For some unknown reason (maybe you like the abuse) you proceed to the checkout (at the back of the store) credit card in hand. You approach their front door and it automatically opens for you. Upon entering you are greeted with a clean organized store, brightly lit, clear signs showing you where to go, and a smiling sales rep that asks you if they can help you. (These guys clearly know what they are doing.) Within 7 minutes have found the shovel you were looking for originally (prominently displayed up front I might add because it is on sale), already paid for it and are heading back to your car. This is the type of experience you expected when you left the house and you’re sure to return to this store the next time you need anything hardware related. The store has won you over and the competitors will all be closing their doors soon. Remember, if the rest of the business is not setup to address the customer needs and concerns, the sales simply won’t happen—no matter how much traffic you attract. Yes, you should be working on traffic generation and should never stop, but make sure you don’t neglect the other aspects of the business while doing so. Don’t put the cart (i.e. traffic) before the horse (i.e. customer experience).